Hannah's Gluten Free : Coloured Shampoo? Not for me! Normally I would not do a post on something I truly do not like because if you have nothing nice to say, don't say anything at all right? I also want to point out that I have only tried the Superdrug brand of this product and I don't know if batiste, boots, etc. coloured dry shampoo are the same and this is not a reflection of all Superdrug own brand products because I love many others of their products! Well I feel this is the case 99% of the time, however this time this product was so disappointing I want to share my experience, no I know it didn't kill me or cause serious harm to any one but at the same time it was very irritating. A couple months ago I picked up my normal dry shampoo in Superdrug (batiste) and saw the super drugs own brand 'Superdrug Chocolate Brownie Dry Shampoo' for dark hair and I have never picked up the batiste version and for 3 for £2.50 or £1.05 each I decided to pick up three so my sister could have one too. I used up the batiste dry shampoo this week and moved onto the super drug one on saturday. Baring in mind I only use minimal amounts of these products in my hair, I was surprised to find I only have to touch my hair and my fingers were dirty, I was expecting to transfer slightly because it is obviously coloured but not to the extent it did! This would not have bothered me too much normally but I was actually dress shopping for cream dresses and accessories with my mum for an event she is going to in a couple of weeks, this resulted in me being completely paranoid all day that I was going to get marks on the dresses and accessories in House of Fraser. I emailed Superdrug, not to complain essentially but just to make them aware that this product has way too much transferring and therefore isn't really useable, unless you do not touch any light! They were very quick at responding with an apology and also telling me that this would be forwarded to the own brand product department so they are aware and they also thanked me for taking the time to email with the issue because if they are not told, they don't know, (very true). I was very happy with the customer service I received and that they do care about customers opinions. 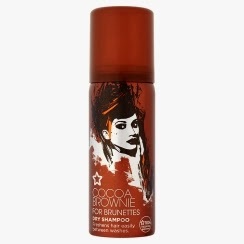 I don't want you all to think own brand products are bad, there are many Superdrug and other own brand products I really enjoy but this one was truly awful, perhaps the batiste brown is the same? From now on I am definitely going to stick to what I know, no more coloured shampoos for me!